The opposition party announced yesterday it plans to reduce the migrant intake to 170,000 a year from about 300,000 last year over its first term. 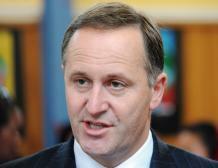 "I'd be surprised if that meant a reduction on the access rights that New Zealanders enjoy to travel to Australia. "Last time I looked, Australia has welcomed New Zealanders as a very important source of human capital. But at the end, it's up to them to determine their own policies." Mr Key said if the Government had an indication new migration policy would impact on New Zealanders' rights to go to Australia, "then we'll take that up with the relevant government. "But let's just all see how it plays out." Liberal leader Tony Abbott did not outline from where he would cut migrant numbers, but said it would not touch employer nominated categories. "There are some very large components of the immigration programme that if reduced would certainly bring us very swiftly to the 170,000 maximum that we're nominating. So it's just a question, it's just a question of intelligently managing the programme, making sure that all of the entrants in these various categories are fair dinkum," he said. "What we won't cut, though, are the various employer nominated categories, because ... business does need to continue to grow, and it's very important that we don't put any obstacles in the way of growing business." Ms Gillard said Labor had already been implementing changes Mr Abbott proposed, bringing down numbers from 300,000 to 230,000 and now predicted to be 175,000. "So the trick here - and I think Tony should really reveal the trick - the trick here is Tony today has promised the Australian people, Tony today has promised the Australian people what I'm already delivering to the Australian people. It's pretty clever, but it's a trick," she said.